The big show starts in about an hour and your teacher leads a beautiful and inspirational barre before they open the theater for the audience to enter to find their seats. Then you go backstage and finish getting your costume on while you wait with excitement for the show to start and your turn on the stage. Even if you had the perfect warm-up before the show started, you will need to re-warm yourself up prior to dancing on stage if you have any downtime. 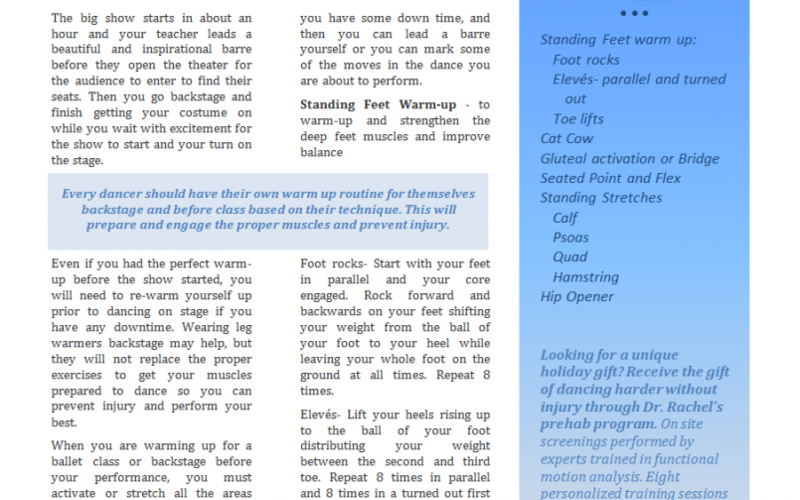 Wearing leg warmers backstage may help, but they will not replace the proper exercises to get your muscles prepared to dance so you can prevent injury and perform your best. When you are warming up for a ballet class or backstage before your performance, you must activate or stretch all the areas you are going to engage while dancing. The important areas for ballet include your spine, abdominals, glutes, hips, thighs, calves, ankles, and feet. If you are warming up before class, these are great exercises to do before you begin the barre routine taught by your instructor. If you are not getting another group barre, these exercises can be the warm-up you do between dances in your performance after you have some down time, and then you can lead a barre yourself or you can mark some of the moves in the dance you are about to perform. Foot rocks- Start with your feet in parallel and your core engaged. Rock forward and backwards on your feet shifting your weight from the ball of your foot to your heel while leaving your whole foot on the ground at all times. Repeat 8 times. Elevés- Lift your heels rising up to the ball of your foot distributing your weight between the second and third toe. Repeat 8 times in parallel and 8 times in a turned out first position. Toe lifts- Return your feet to parallel. With your weight on your heels, lift forefoot off the ground 8 times. Hold onto a barre if need. Start on all fours. Tuck your head down and pull your mid-back as high up as you can, making an arch with your back; hold for one full breath or a count of 5. Then, reverse by lifting your head up and dropping your back down, making your spine into a “U” shape. Repeat 8 times in each direction. Start by lying on your back with your knees bent and your feet flat on the floor. Squeeze your gluteal muscles without tightening lower back or hamstrings. You should not perform a bridge exercise (raising your hips up in this position) until this exercise is done properly. Perform a gluteal squeeze 8 times or, once you have mastered the gluteal squeeze, hold a gluteal bridge for 3 counts of 8. Sit on the floor with your legs stretched out in front of you. Slowly point and flex your feet, emphasizing each step along the way and pausing for a moment when your feet are fully pointed and then again once they are fully flexed. Working the flex is just as important as working the point. Calf – Stand in a parallel lung position, front leg slightly bent without knee going past the ankle. The back leg is the calf getting worked. Hold for 3 counts of 8. Then, bend the back leg keeping your heel on the ground and hold for another 3 counts of 8. Repeat on the other side. Psoas – The psoas is the main hip flexor. Stand in the parallel lung position, the hip flexor of your back leg can be stretched by tucking your pelvis under and holding for 3 counts of 8. Repeat on the other side. Quad – Standing on one foot, keeping your knees together, bend your right knee and grab your right ankle with you right hand. Do not arch your back or lift your knee out to the side. Hold for 3 counts of 8. Repeat on the other side. Hamstring – Most dancers have their favorite hamstring stretch already whether that be putting your leg up on the barre, doing splits, the inch worm, a seated stretch reaching for your toes, or lying on your back bringing one leg up to your chest. Any stretches should be held for 3 counts of 8. Using the barre for balance, face the barre and lift one leg off the ground turned out with your knee bent at a 90 degree angle. Swing your knee out to the side at the hip and then bring it back in front of you. Let the bottom half of your leg relax and swing freely. The movement should be quick, but still have a relaxed, rhythmic feeling to it. Repeat about 8 times and then switch legs.